1. Marshmallows. 180 strands of marshmallows over a table?! I love the whimsy of it. 2. A DIY Nepali Hanging. What pretty colors! 3. Colored Poofs & Poms. So pretty! I love this for a baby's room especially. 4. Books. 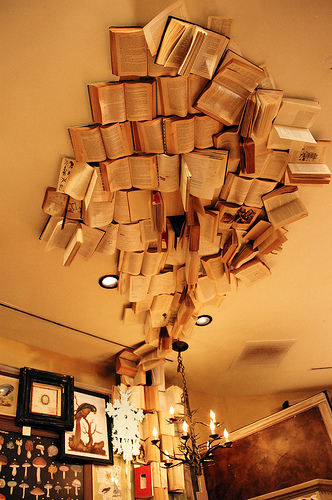 This would be perfect in a little study or library. 5. 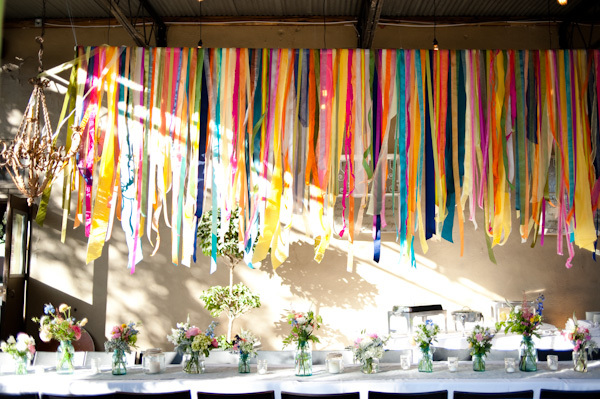 Ribbons. This is so simple but look how stunning! um....YES to the marshmallows. 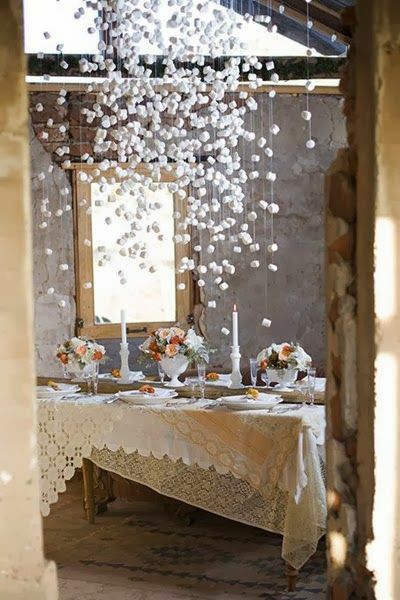 that would be beyond awesome for a dinner party. best idea I've seen in awhile - thanks for sharing lady! Wow I love those marshmellows and the books! The marshmallow idea is pretty rad. Although, I can see myself snacking on them periodically. love the marshmellows! wonder how long they would last before they went bad? The books would make me nervous! Love them all! I really want to get a little chandelier! I think it would be a nice addition to my new apartment! Ooooh the books are COOL!!!!! Oooh marshmellows?! I'd probably eat them though. Haha. I vote marshmallows, or any kind of candy, and the ribbons! Or even combine the too. Although the books are cool, I think the "clutter" might bother me lol.